Try these links to Samoa! - Amerika Samoa & Western Samoa. I departed Kona, Hawaii airport on Thursday, 10 Sept at about 10:15am local time from a reassuringly long 11,500 ft runway, and immediately headed out to sea (the airport is right on the coast). The takeoff went even better than at Oakland. I kept the airplane on the runway during the takeoff roll until it insisted on lifting off on its own, which occurred at about 75 KIAS. The normal landing gear configuration of the Mooney puts it in a 7 degree "nose-up" pitch position when on the ground. The airplane needs well above 12 degrees nose up before the wings will "stall," so if it is flying at 7 degrees, then at least I know everything's OK while accelerating in ground effect. I flew along within a few feet of the runway surface until exceeding 90 KIAS, raised the landing gear, and then slowly climbed out of ground effect. As at Oakland, the climb rate was slow (200 - 300 fpm), but I was now ready for this sluggish performance and was comfortable with it. As long as there wasn't any significant turbulence, which there wasn't, climbing to 6,000 ft was a piece of cake. It just took awhile! Time enroute to Faleolo Airport in Apia, Western Samoa was predicted during my flight planning to be about 15 hours + 5 min. I was a bit concerned during the first few hours after leaving Hawaii, as the winds at my altitude were more adverse than forecast, and a recalculation of my total time enroute now predicted it would take more like 16 hours total flight time. I had 18 hours and 30 minutes of fuel on board at normal cruise and consumption rates, but I always like to land with at least 3 hours of fuel left in the tanks when on a trans-oceanic flight. That provides adequate reserves for unexpected problems with winds aloft, weather deviations, and traffic delays (the latter HIGHLY unlikely in the middle of the Pacific, though!). I decided to fly about one-third of the way to Apia, then reappraise the situation. If I would be cutting into my fuel reserves, then I would simply turn back to Hawaii and try another day when the winds were more favorable. As it turned out, the winds swung around to have a fairly strong tailwind component before that time, and so I was very comfortable in deciding to press on. The only challenging part of the flight came at about 8:30 pm local time when the sun went down, leaving me literally a thousand miles from the nearest human being in an indescribable pitch darkness, broken only by the dim instrument lights in front of me. Though not a safety problem, puffy cumulus clouds appeared at my altitude, jostling the airplane a bit, requiring me to disconnect the autopilot and "hand fly" for awhile. Also, there were a few scattered thunderstorms lurking about, and I had to use both the stormscope and radar to thread my way around them. It was great to be able to do this with absolutely no concerns about causing air traffic conflicts with all those S turns, which is what would have happened in similar weather conditions back in the States. As it was, Nadi Control (based in Fiji) reported that I was the only airplane in the sky for many hundreds of miles, and I could basically go anywhere I liked! What a blast! I landed at Apia at about 12:45 am local time, resulting in a final time enroute of 15 hours + 30 minutes. No problem. It's a good thing that I had a lot of gas left when I landed, though. Despite a previously faxed promise to the contrary, I was told upon my arrival that Apia had no Avgas on site, but I could get some at the island's other airport "just a few miles away." I caught a taxi and headed off to the hotel without giving this much of a thought. The next morning a quick look at the local chart showed that this other airport had only an 1,800 ft runway. . . much too short for my Mooney, even at very light weights! Thankfully, I still had enough fuel on board to easily make it to Pago Pago, American Samoa about 100 miles away, where avgas was plentiful. I planned to fill up there before turning back southwest to head for Fiji. Anyone thinking of flying to Apia should keep this in mind. 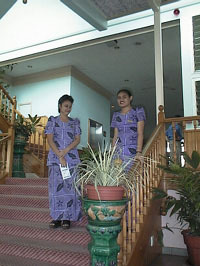 Western Samoa is an intoxicatingly attractive and friendly country. While living at what would normally be considered the poverty line elsewhere in the world, the locals are amazingly content living in their communal villages in open walled "fales," which are small, raised, thatched or corrugated metal roofed structures in which all village life takes place. Each village shares everything among its residents. There is no personal property. Each village raises coconuts, mangoes, and or bananas in very small quantities on tiny jungle-like plots. The villagers sling these products over their backs in home-made baskets and carry them once or twice a week to the public market in Apia to sell them. Samoans don't possess much in the way of material things, but then again, they don't seem to need very much, either. With the exception of the occasional devastating cyclone (the last passed through in 1991), the weather is terrific all year, with nights dipping into the 70's (F) and days climbing only into the 80's. Not much need for either heat or air conditioning here! The daily rains are ignored. Folks just keep going about their business without so much as covering their heads or even seeming to notice the drenching they're getting. No wonder. They wear light lavalava's, which are thin, colorful, waist to mid-calf wrap-arounds that quickly dry out in the breeze after the rains pass. 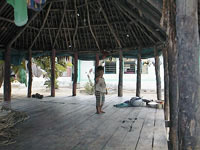 Almost no one wears shoes of any kind in the villages, although sandals are common in town. Everywhere I went, from the luxurious Aggie Grey's Hotel in downtown Apia, to the simplest village out in the countryside, Samoans went out of their way to wave and say hello. What few vehicles there were all beeped "hello's" to each other whenever they passed. No one asked for anything. There is no tipping, not for taxi's, not for waiters, not even for the excellent local tour guides. Prices are dirt cheap for everything, except those products that must be imported at great expense (e.g., gasoline, which goes for about $4.00 per gallon). Aggie Grey's Hotel is a real monument. Agnes Grey set up a hot dog and hamburger stand in Apia back in World War II to serve the American GI's training for upcoming island invasions to the north and west. Acting somewhat as their "nanny," Aggie became a very popular cult figure to the GI's, and one of them, a young naval historian named James Michener, later used her as a role model for the "Bloody Mary" character in his Tales of the South Pacific novel. When Richard Rodgers and Oscar Hammerstein turned that book first into a successful musical theater piece and then later into a popular movie, word of Aggies' fame got out. Tourists flocked to the little clapboard hotel she had built, and it flourished. Aggie passed away in 1989, but her family continues her tradition of providing world class hospitality at what has by now become a glamorous address in the South Pacific. I was delighted to be lucky enough to secure a reservation on short notice. 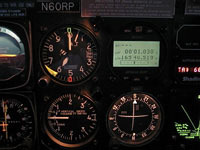 The instrument panel as I crossed the equator (OK, a mile later!). Latitude is 0 degrees north and south. 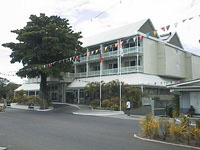 Front view of Aggie Grey's Hotel in Apia, Western Samoa. The interior of Aggie's. The staff was pretty nice to look at as well! 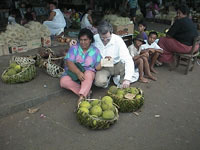 Here I am buying breadfruit from a vendor at the Apia market. This is the stuff that The Bounty was carrying as cargo when the famous mutiny occurred. 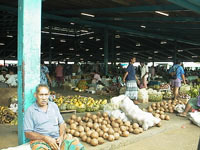 Apia's public market. Except for fish, everything is sold here, even airline tickets! Fish is sold in a separate fish market on the Apia wharf. A Samoan boy bringing supplies back from a trip to the market in Apia. 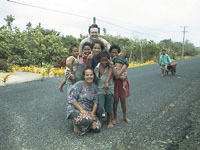 Friendly Samoan family that greeted me near the beach. 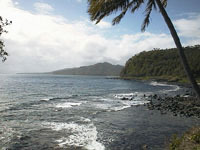 A Western Samoa beach, on the southeastern edge of Upolu Island, near the village pictured below. 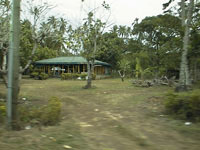 Picture of a Samoan village. The fale in this one is larger than most, and has a metal roof. Shy 2 yr old boy hiding from me in the middle of his villages' fale.